Database Administrators evaluate database software purchases and supervise the modifications done to existing database software. They maintain the integrity and performance of company databases and ensure that the data is stored securely. Database administrators secure company data through controlled access. To do this they create databases with certain security clearance depending on the role of the user within the company. Monitor user access and security. Map out conceptual architecture designs for databases. Assign user roles according to needs and security clearance. Possess an eye for detail in order to monitor user access. Think conceptually to effectively manage the database. Follow security procedures to protect sensitive information. Communicate clearly with staff to explain the importance of data policy. Maintain a solid work ethic. An entry level position is possible to obtain without a degree as long as the candidate possesses general IT skills. However, a Bachelor’s Degree in computer science or mathematics is preferred. Additionally, preference is given to candidates with prior IT experience, especially experience managing databases. How would you improve our 15 hour database backup? 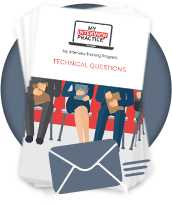 How would you handle a difference of opinion between you and a senior technical member? If there was a database incident, what steps would you take to resolve the issue? What role should a manager play for a database administrator? What is a trigger in a database? Can you name the 5 different database objects?